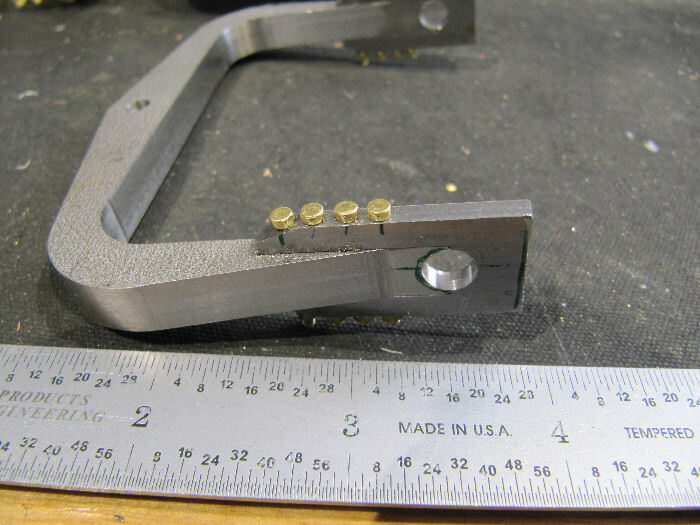 Very nice work on the Yoke, Chris! So, are you going to work your way down from the bucket, through the boom, to the base? I keep changing my mind on that. At least the door will be made, then I'll decide whether to go front to back, down to the turntable. The crowd engine will be later, but may do the rest. Or, was thinking about making up the frame rails next. Will he or won't he? Tune in next week for the next episode of The Shop Elf Chronicles!! Look good Chris. You're a master metal carver! If it keeps snowing up you're way you're going to need to put that shovel to work. This week we have only gotten 5 or 6 inches of snow here, its just to the west along Lake Erie where they have gotten 5 FEET in two days! For us its the cold, down in single digits (F) all week,so I would rather be the boiler engineer than the guy up on the turntable this week! Back on the yoke clamps this morning, cut some bar stock long enough to get out both clamps, trimmed to width, and drilled the pivot pin holes. 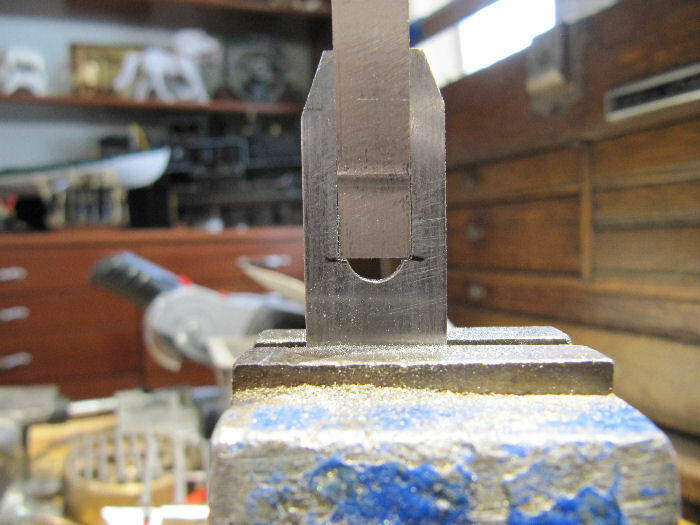 Once the arms were a snug fit in the slots, moved over to the bench vise and filed the corners square so the arms would sit down in all the way. I would have done this on the mill, but the cutter was not long enough to reach all the way in from the ends. 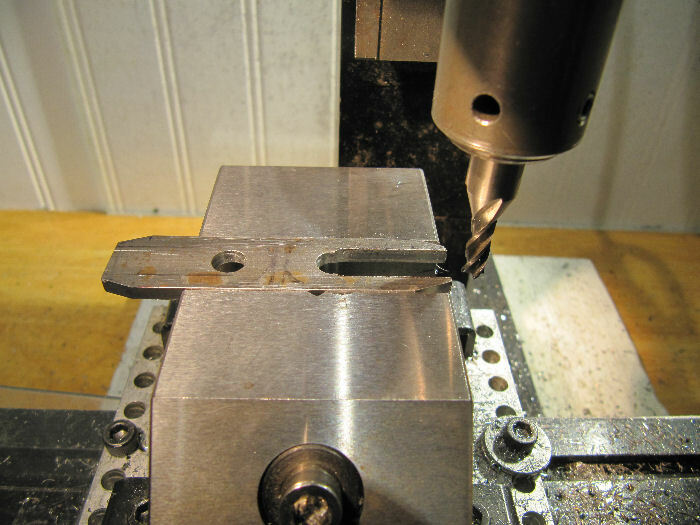 Next I needed to mill in the half-holes in the yoke arm ends - to get a firm hold on the arms, I used a smaller milling vise to hold the part, and clamped that vertically in the larger mill vise. 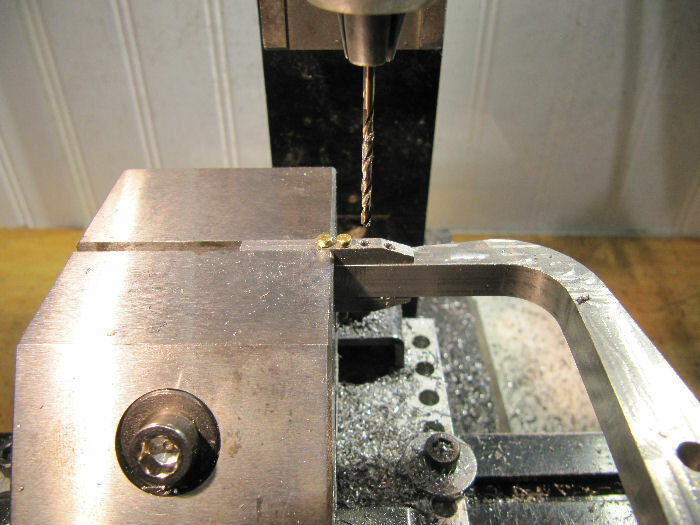 Then used a 1/4" end mill to plunge cut the holes, lined up with the hole in the yoke clamp. Worked very nicely. I enjoy your love for the details. That's coming along very quick, the fine detail looks great. Thanks guys!! Having fun with this one, learning some new techniques here and there. 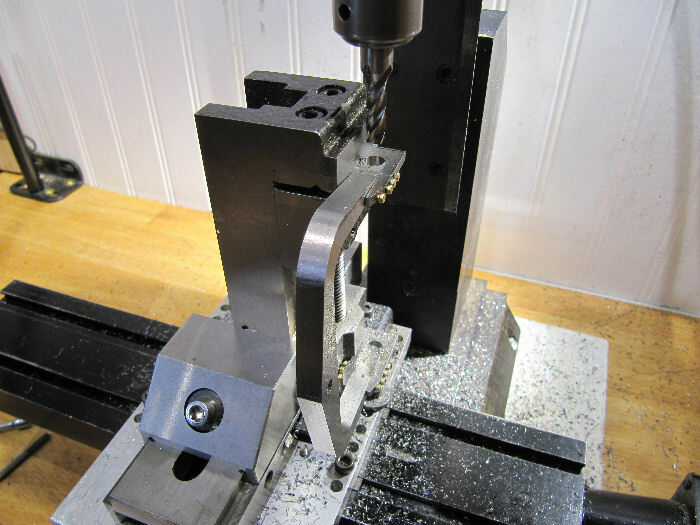 One more operation this afternoon, set up the rotary table again with the same holder that I used earlier on the yoke brackets, and rounded over the ends of the clamp brackets. 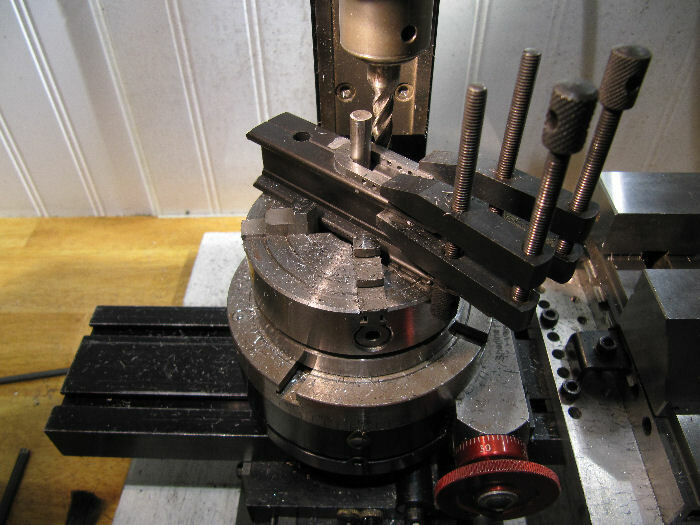 The rod steadying the parts is centered in the 4-jaw (did that on the lathe with a dial indicator) and the chuck is self-centered on the rotary table with the chuck adapter into the center hole of the table. 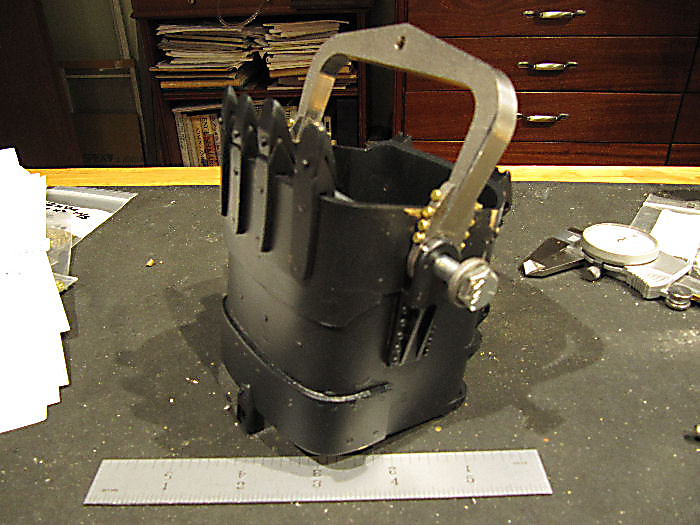 Here it is assembled again, with a 1/4" drawbar bolt to hold the yoke in place. 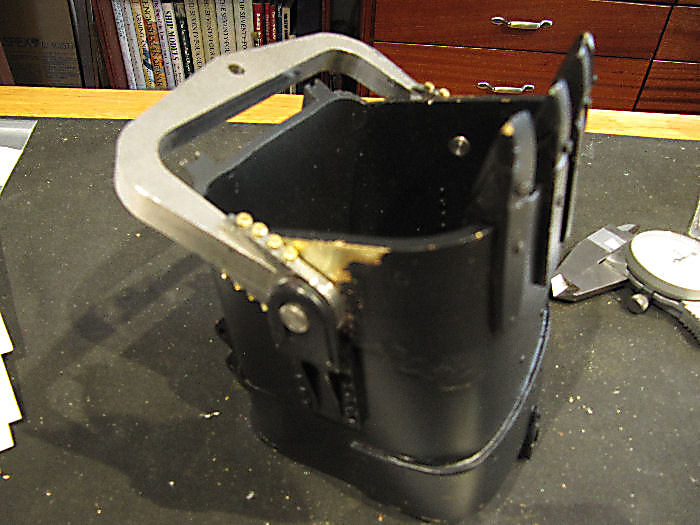 Next step is to make the short pivot pins to hold it in place for real. That is looking just great! Nice to have the ruler for size. Better go see how the growing, got a feeling that I'm going to need more.......LOTS more!! Better plant a couple of years worth! 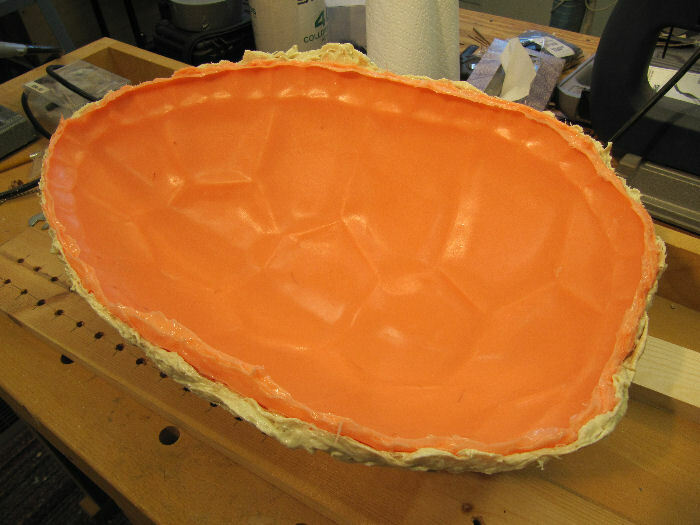 The orange is the silicone rubber mold itself, and the off-white surrounding it is the plastic mother-mold, which keeps the rubber in proper shape. 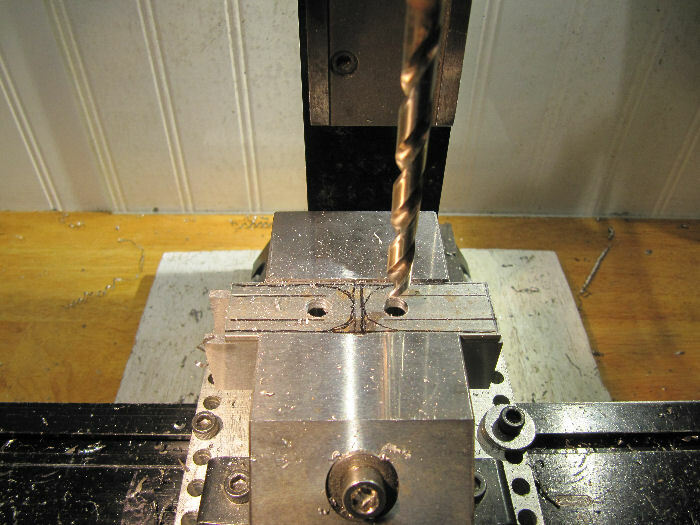 Both are from Smooth-On, which supplies all sorts of molding products. The rubber is a two-part platinum-cure silicone rubber, can be recoated in an hour, cures in 6 hours, where the plastic is a fiber-filled two-part mix made specially for this use, it does not stick to the rubber so it can be pulled off the molded part, then the rubber section peeled away from any undercut areas. This is the first time I've tried this, so far so good. I have the molds for the bottom of the shell and the head/tail/flippers in process now. The shell and front of the head will be cast with fiberglass, the rest will be cast in another of thier rubber products, which starts as a milky color, but they have pigments you can add to the mix as well as paint on afterwards, so the flippers/tail/neck can all be articulated. More to come as this progresses, now back to the metal shop for the Marion bucket! That bucket looks MEAN Chris! Bad Behavior has blocked 15649 access attempts in the last 7 days.